When you’ve been married for a while, dates can get to be boring and repetitive. Dinner and a movie. Eating out, then ice cream. Renting a movie. My husband and I are no stranger to this phenomenon. That’s why I made a Date Jar. The Date Jar is full of ideas for dates that don’t involve a movie. We draw a folded piece of paper out of the jar every week and go on that date within the next week. It is quite fun because we are doing different things each week, instead of just going out to eat or watching a movie. The truth is, though, that we don’t go on dates every week, because life happens. Give yourself permission to not be perfect and just enjoy the dates you do go on. First, find a container. It doesn’t have to be a jar; it can be a box, a basket, or some other organizer. I like mine to have a top, so the inside doesn’t get dusty. A cookie jar might be a nice size or a Mason jar. I found mine at a thrift store. Next, decorate (or don’t) to suit your taste. I printed the directions and stuck them to my jar with stickers. I also put little heart stickers all over the jar. Finally, fill the jar. I have provided 25 ideas to get you started, but you can probably come up with many more. Each idea should be on one piece of paper. All the paper should be approximately the same size. I’ve made a printable of my list of ideas for you to get started, and a blank page for further ideas. Once a week draw one date from the jar. If the date is inappropriate for the season or impractical due to finances or time constraints, choose a second date. You may do this three times before having to commit to a date. Decide together when the date will take place and mark it on the calendar. Decide what preparations need to be made and who will be responsible for making them. After the date is completed, decide if it’s a keeper (return to the date jar, or a second ‘used’ jar) or a throw-back (trash the date slip). At any time either person may add other dates to the date jar. Go skating. Many communities have skating rinks or ice skating rinks. If you can find one close to you, check it out. If you’ve never learned to skate, maybe this is the time. After working off many calories skating, you’re entitled to finish the date with pizza or ice cream! Ice skating, rollerblading, or old-fashioned skating – it doesn’t matter as long as it’s on skates! Go sledding. When the snow comes, you might as well make the most of it. Sledding is something that almost anyone can do, and free or cheap – unlike skiing and other snow sports. Find a hill with snow, get a sled or toboggan, and enjoy the white stuff while it lasts. Go to a state or national park and walk trails. You don’t have to be an avid hiker to enjoy this date. Walking trails in parks are usually well maintained and only a few miles long. Take some water with you, your dog if they’re allowed, and a lunch. Take pictures of the beautiful creation to remember. Going in different seasons will give you an entirely different experience. Have a picnic outdoors. Find a park that has picnic tables or locate a spot that has room for a blanket, so you can sit on the ground. Make it more fun by packing a good lunch (leave the PB&J for another day), playing Frisbee beforehand, and watching clouds afterward. Go bike riding. Find trails or explore your neighborhood. Not only in bike riding good exercise, it also gets you out in nature, takes you new places, and exposes you to things you’d miss if you were in a car – like the new neighbors planting flowers, the bluebirds and cardinals along the way, and the quaint coffee shop you never knew about. Get up to watch the sunrise on the beach or at some other scenic location. Pack an easy breakfast to enjoy while watching the day begin. Be sure you go to bed a bit earlier if necessary the night before. Remember your camera – there’s nothing like sunrise pictures! Read aloud to each other. You could make this a daily or weekly habit. Choose a book you’re both interested in and take turns reading aloud to each other. You could even discuss the book. Who’s your favorite character? What will happen at the end? Who is the villain? What makes him or her a villain? Make a gingerbread house. From scratch or from a kit, this time-honored Christmas tradition can be lots of fun. Be sure to have plenty of hot cocoa and Christmas cookies on hand for the work and to enjoy afterward while you admire your creation. Dye Easter eggs – even if there are no little kids around. Be creative. Google how to make patterns, designs, and different colors, then pretend you’re eight years old again and have fun. Afterward, when everything is put away, investigate recipes using hard-boiled eggs! Choose a meal you’ve never had and make it together. Use your cookbook collection or my favorite cookbook to find several recipes you’d like to try. Then choose one for your next date. One of you could be in charge of getting all the ingredients, while the other makes sure you have the right pans and other supplies. Divide up the actual cooking chores so you each are a participant, not a spectator. Go to a museum. It could be an art museum, a science museum, a history or railroad museum, or something else. Take your time wandering the exhibits and learn something new. You might find a new hobby you want to return to again and again. Visit an aquarium or zoo. There’s something special about seeing animals at a zoo or aquarium. It gives us a glimpse into a world most of us would never otherwise see. We can learn about them and enjoy watching them while getting a good workout from all the walking. If you live close enough, consider buying a yearly pass and going back often. Attend a local high school football game. Cheer for the home team. Buy hotdogs and popcorn. Enjoy the half-time show and compare it to your own memories of marching band. If possible, attend the homecoming game, complete with watching the parade beforehand if there is one. Afterward, pull out your old yearbooks and wax nostalgic over your high school days. Play board games or cards. Family game night doesn’t have to be just with the kids. Find good two-person games to play, such as Othello, dominoes, or Yahtzee. Play card games that are just as much fun with two as with four. The rules for most games can easily be found online. Visit a planetarium. Not quite as much fun as star-gazing outdoors, but you can guarantee the view. See the constellations and learn about the stars. Investigate what your local university offers to the public. Many colleges or universities have art galleries, science exhibits, music recitals, and other attractions open to the public. Choose one and attend it. Go to a play or musical. It doesn’t have to be professional. There are plenty of amateur productions that are enjoyable in most communities. Your local college or university might also be a source of entertainment. Go to a concert. Again, it doesn’t have to be professional for you to enjoy it. Many local bands play local venues, and you could just find a bar or restaurant you enjoy and go hear live music. Festivals and fairs are also a great source of music entertainment. They may not be free, but they are usually worth the money. Check out your community calendar, then put it on your date calendar to attend. Visit thrift stores or antique malls. Shopping is not everyone’s hobby, but the thrill of the hunt in thrift stores and antique malls is something most people can get into. Decide what you’re looking for before you arrive – either to buy or just to say you saw it. Go for a long drive, stopping whenever you feel like it. Stay off the interstate, explore backroads, and stop at little towns along the way. Even if you don’t get far, you’ll enjoy yourself because of the adventure and the company. Take a class together. A cooking class? An art class? A photography class? Or something else that strikes your fancy. Take turns choosing which class to take, so both your interests are broadened and shared. Go to a painting party. Painting parties are very popular in some cities and reasonably priced. You get to paint a project under the direction of an artist and everyone’s painting will turn out slightly different. You and your spouse will each have a painting to take home. Some painting parties even come with food or drink. Tackle a home project. This will really build your relationship. As you tackle a home improvement project, from conception to completion, you will learn a lot about each other. Maybe you want to do a backsplash in your kitchen, re-do the flower beds, or make a bookshelf for your daughter’s room. Whatever project you choose, it’s more fun done together. Ride go-carts. Go-carts are lots of fun. You get to speed around a course ringed with tires. You might be a perfectly safe driver on the roads but let your inner NASCAR driver out to play at the go-cart track. Go to an arcade. Air hockey, skeeball, whack-a-mole, and lots of video games. What’s not to love? Top it off with a pizza and you have a super-fun, easy, and memorable date. 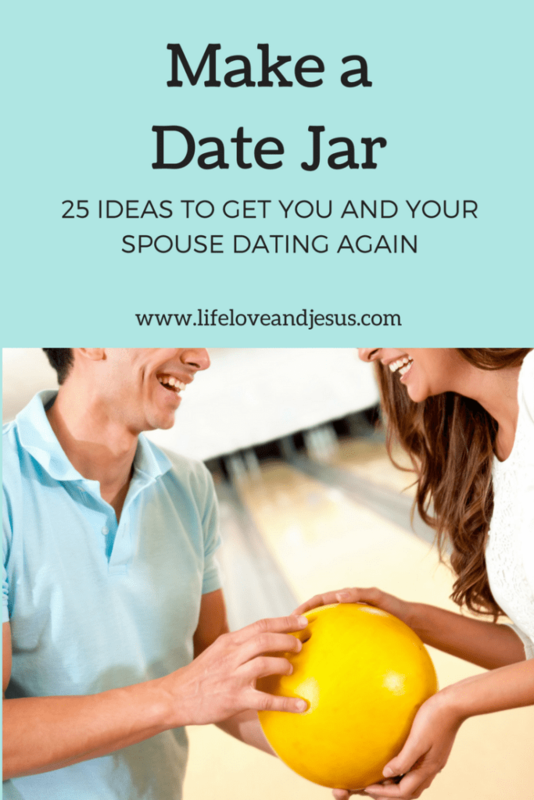 Don’t forget to pick up your free printable in the Resource Library so you can make your Date Jar and get dating again. You will find the dating printable and many more resources.